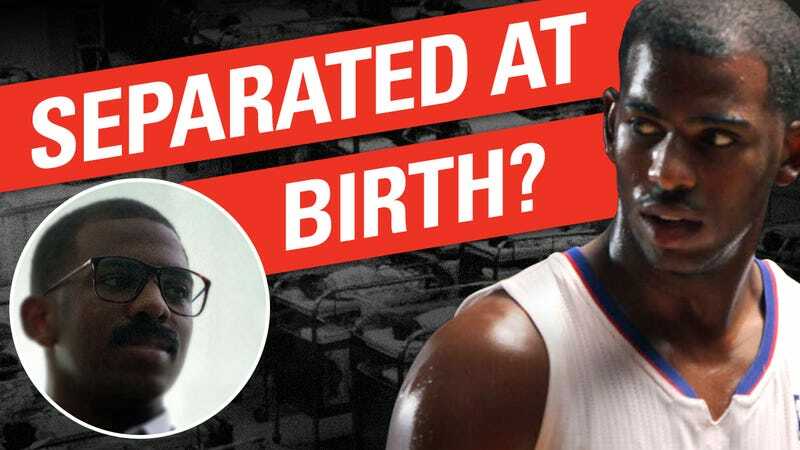 EXCLUSIVE: Could This Be Chris Paul’s Secret Twin Brother? In a storyline more suited for a Lifetime movie than an All-Star, it looks like Chris Paul might have a twin brother he never knew existed. Rumors about a "big-league athlete's unbelievable separated-at-birth drama" have been kicking around for a while, but it wasn't until a few days ago when a tipster sent in the photo featured above that the whole story started seeming like it could actually be true — and that the athlete in question might be Paul. Hey, I thought you might be interested in the attached picture. This is my buddy Cliff. I've been telling him since Chris Paul got drafted that the two of them could be brothers. As it turns out (given some news that Cliff just got about his dad) they actually might be. Chris is a totally normal, low-key dude from NC (works as a State Farm agent, does a terrible Michael Jackson impression, Instragrams pictures of his feet), so the whole thing is pretty overwhelming for him. I'm not sure he's ready to talk about it, but I just had to share. After taking a close, side-by-side look at their photos, the resemblance is definitely there. Calls to both Cliff and Chris Paul's camps have yet to be returned. Updates to come as more information comes in.